We've seen the "We got it wrong" messages." We've seen the "We're listening to our members" messages. We've seen the "changes" to board certification: from the change from permanent certification to time-limited in 1986, from dropping the requirement for dual board certification for subspecialists to the requirement for just one subspecialty certification, and from board certification being about a more "continuous" requirement for education. And we keep hearing the excuses by all 24 ABMS member boards that they really want to change the MOC program after all of the corruption of the system has been exposed over the past two years. But what you won't hear about from anyone involved with the Accreditation Council of Graduate Medical Education (ACGME) is anything about the money involved. Practicing physicians are funding a profiteering racket. This is what time-limited board certification is about, nothing more. Proof of this can be found quite plainly at this website run by the American Board of Medical Specialties that promotes "ABMS Solutions." (video here). ABMS "Solutions"sells "CertiFACTS Online®," "ABMS Certification Profile Service®," and "Direct Connect Select™" through Cactus, CredentialSmart, MD-Staff, and Vistar software systems. We can see how the ABMS colludes with the Federation of State Medical Boards' (FSMB) newly-launched DocInfo service that "provides professional information on physicians and physician assistants licensed in the United States including information on disciplinary sanctions, education, medical specialty, licensure history and locations." Only CertiFACTS’ products connect professionals with board certification information that is updated daily with data provided by the 24 certifying ABMS Member Boards. Physician ABMS board certification status, updated daily, and shot to a certification database near you. All for the low, low price of hundreds of millions of dollars a year and funded (in part) by every US physician. It doesn't matter what new changes each of the member boards of the ABMS propose to change Maintenance of Certification (MOC). The whole time-limited ABMS board certification is all about the money. This is just one example of how the money pipeline overrides the welfare of the physician and their patients. Between surveys, productivity ratios, data entry requirements, and now the board certification monopoly created by the ABMS, I wonder how far the System thinks it can go before our new nation of employee-physicians unionize. This graph sums up another reason the American Board of Medical Specialties' Maintenance of Certification (MOC) program (implemented by the American Board of Internal Medicine in 2005) is such a mess. I was appalled. MOC is not longer about "keeping up" for physicians. It is a major distraction. This program is of unproven benefit to my patients and me. Thanks to haphazard and self-serving rule changes by the ABIM and their member boards over the past 25 years, the US Specialty Board system has become increasingly coercive. In fact, MOC program now threatens my ability to practice the work that I love because I could lose my facility privileges and ability to receive payments from insurers on December 31, 2015. That is my reality. This is the reality of every physician subspecialist who participates in the ABMS MOC program in US medicine today. Remarkably, I just re-certified in Cardiovascular Diseases and Cardiac Electrophysiology in 2013 for the third time. I have never failed. I have over thirty years of experience treating patients and standing in the cross hairs of what it means to be truly accountable to those I treat. I have had over thirty years of nights when I lie awake at night worrying about by patients, about if I did enough, about why a patient had to die. My family, too, has endured years of being woken in the middle of the night or seeing their father have to leave a school play, holiday concert, or friend's dinner party to place an emergency pacemaker. I am not unique. I am a practicing physician everyman. I stand in unison with hundreds of thousands of others here in the United States just like me who get up every day, kiss their loved ones, and head off to do their favorite job in the world - a vocation so completely immersive and rewarding that we gladly give up a part of ourselves to earn the trust and faith of our patients and fellow physicians. And because I've been practicing medicine so long, I know I do not need a private, unaccountable, and irresponsible organization to tell me how to behave. I am better than that. After experiencing the busywork of the evolving MOC program and its lack of value for the time spent, I looked into the corporations who promote this exercise. I had the help of accountants and fellow physicians who were similarly upset and uncovered a vast array of hidden financial activities of the ABIM and their collaborators. There is so much financial corruption it is mind-boggling. The conflicts of interest that are never acknowledged and corrected make my stomach churn. The practice of medicine is better than this. Practicing physicians are better than this. We do not need some dystopic corporate Big Brother watching over us to assure we log into a computer every so often to enter data that can be used against us. We do not need webcams, video monitors, body inspections, keyboard tracking, and palm scans to prove we are honest and ethical and won't cheat on examinations. But this is what the ABIM has become: some new form of quasi-police state for monitoring physicians. Working in fear is not what I want for medicine. It certainly is not how I want my youngest colleagues to grow up learning and practicing medicine. But the ABIM and their parent organization, the American Board of Medical Specialties (ABMS), seem to love fear, humiliation, and intimidation to get doctors to participate in their lucrative MOC program. It is sickening. It is also the height of hypocrisy for these organizations to claim to run an organization that attempts to "Choose Wisely" when that same organization funnels tens of millions of dollars for itself from hard working physicians so they can choose an investment portfolio with multi-million dollar condos, meet at swank meeting venues, pay for spousal travel fees and first class airfares as they preen themselves in front of media lights. 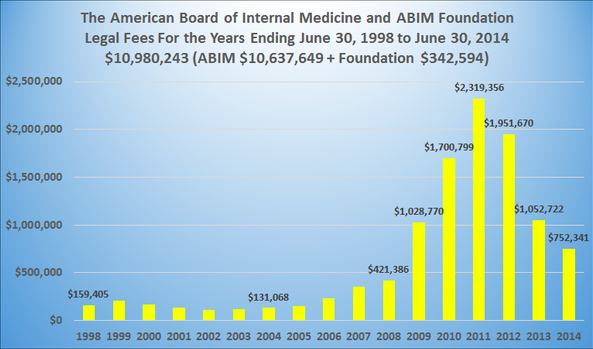 The ABIM Foundation "created to define medical professionalism" for the public? Give it a break. Rest assured I am not naive. I know how important this MOC program is to certain investors. As I peel back layer after layer of the interconnected workings of these ABMS member boards and the ACGME, I know how high this MOC program goes and how dark this MOC program and its tactics have become. I completely understand that these specialty board organizations have managed to wedge themselves into our new health care law that calls itself "Affordable," wedged there by undisclosed lobbying efforts funded by the very doctors whose blinded trust was violated beyond comprehension. Just because these corporations want to make a buck. So let me take the stick a moment. Let me be perfectly clear and I don't say this lightly. I'm sure I say this on behalf of tens of thousands of other hard-working, honest, and ethical physicians. 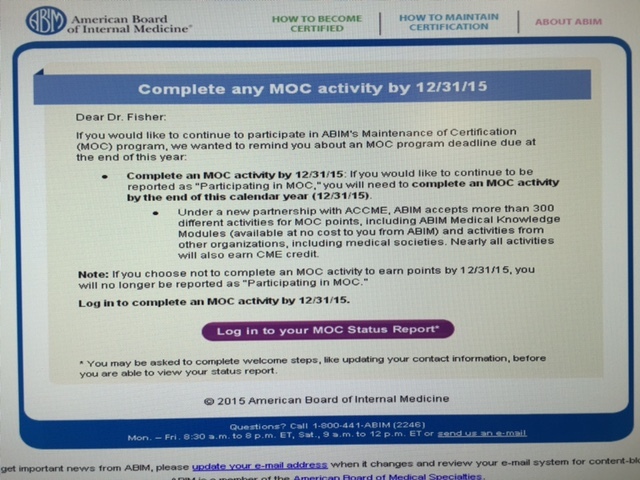 We have had enough of the ABIM and the ABMS MOC program. It is time to end it - completely. No more "modifications" to make this broken program "easier." No more "listening" to our concerns but continuing this failed experiment. No more "MOCA Minutes" that we have to turn our gaze from our patients toward the computer screen or iPhone even longer. Continuing the ABMS MOC that has proven itself to be morally and financially corrupt, and exceedingly expensive to physicians, patients, and our health care system is ill-advised for our profession. The conflicts of interests alone are worth hundreds of millions of dollars to the corporations that stand to make millions from physician assessment, yet we never hear a word about this from them ABMS or the ABIM on this reality. I am better than how the ABIM and ABMS threaten to label me. I served this great country for twenty-six years as a physician with the United States Naval Reserves and I continue to work every day to make sure I do the best I can for my patients in this increasingly difficult health care delivery environment. I worked then and work now beside hard-working corpsman, nurses, administrators and technicians who don't want to rock the boat and just want to do what's needed to finish our job every day. These people and the patients I care for are why I go to work every day. So I ask the leadership of the ABIM: "Why does the ABIM insist on placing a "scarlet A" on my reputation by labeling me a "Not Participating in MOC?" Such labels are offensive. I participate in ACGME-accredited CME as required by my license to practice medicine in the State of Illinois. I am not a slacker. I teach residents and fellows, for goodness sakes. I am certainly not one who doesn't mind working hard. I am a proud practicing physician with more years of clinical experience and direct patient care than any of you. Please don't be libelous and cast aspersions my way with your on-line labels. I've got much more important things to deal with. Stop pretending that you speak for "the public" and know what's best for them in health care when you don't even crack the door of an examination room or know what I do. Proceeding to take away my hard-earned reputation and ability to practice medicine because of your little label is both threatening and hugely upsetting. Think about these words. Think about them carefully. I beg of you and your affiliated private organizations to stop the labels. The profession of medicine is better than this. By now various medical societies are telling the American Board of Internal Medicine (ABIM) their ship has sailed. The ABIM's worn mantra that the "public" demands their program is simply not supported by evidence. The tales of misguided incentives and corruption within the organization grow daily. The blatant avoidance of the egregious financial dealings and conflicts of interest outlined in this blog's pages and elsewhere simply cannot be ignored by the ABIM - yet they continue to do so. Because there are millions upon millions of dollars at stake in areas of physician assessment and measurement. Recently, a Premier, Inc press release announced its plans to purchase a company called CECity, Inc. I suspect most practicing physicians did not notice this announcement. After all, why would practicing physicians be interested in a press release touting a new business opportunity for Premier as it expands its "performance improvement capabilities across the healthcare continuum?" But practicing physicians need to be VERY wary if our fellow physician-bureaucrats (especially those from the ABIM) when they consider their prior conflicts of interest as "distractions." That word is a flag that everyone should look deeper at these conflicts first reported by ProPublica. When we do, we find more concerning revelations about the ABIM and the American Board of Medical Specialties (ABMS)'s motives. According to the press release, CECity, Inc is worth about $400 million (or more) to Premier, Inc. and who do we find has been using CECity as its consultant? Yep. You got it: the ABIM. As a CMS qualified registry for the Physician Quality Reporting System (PQRS, ePrescribing, MOC-PQRS) and as the service provider for many physician certifying boards (e.g. ABIM, ABO, AOA) CECity is uniquely positioned to align professional and financial incentives with CQI to deliver ‘game-changing’ quality initiatives that have proven and measureable results. According to the ABIM's Form 990's, they have already paid CECity the following: $600,000 in fiscal year (FY) 2010, $1,217,800 in FY 2011, $1,112,600 in FY 2012, $1,378,138 in FY 2013, and $1,260,000 in FY 2014 (an example of these payments can be found on page 8 of the ABIM's most recent published Form 990 - provided they do not change their Form 990 after this report). That's right: $5,568,538 of physician testing fees to CECity from practicing US physicians over five years - all of it (so far) on Dr. Cassel's watch. If Dr. Cassel holds stock in Premier, Inc. from her prior board position there, I wonder how much money she stands to make when this cozy deal with Premier, Inc. closes? Should the U.S. Securities and Exchange Commission investigate this transaction? We don't know, but even the apparent conflict of interest with Dr. Cassel, the president and CEO of an organization responsible for "quality" programs in our nation's hospitals, is very disturbing, indeed. This is not a minor revelation as physicians continue their difficult task of managing patients in such an overbearing regulatory environment while our specialty societies continue to support the financially conflicted ABMS MOC program. I believe allowing independent and unaccountable third-party organizations (like the ABMS and ABIM) to collect and distribute physician and de-identified patient-related data without written consent of those who could have their ability to practice medicine or collect payment from insurance companies revoked if they don't participate in MOC is a clear violation of Department of Health and Human Services Protection of Human Subject statutes. It also remains to be determined if this violates the Sherman (antitrust) Act. After all, it is now clear the MOC program is not a "quality assurance" exercise performed for "public's" benefit. This is profiteering and financially conflicted research on physician subjects in its most fundamental form. I woke early to review my notes; who was attending the gathering that day, the itinerary, the location. Suit, tie, briefcase, cell phone, charger. Check. Soon I stood in line with familiar faces at the Rayburn building waiting to pass through security, remembering my wife's comments about the DMV. "Bags on the conveyor, folks. Jackets, too. Sir, you can leave your suit coat on." Of course. What was I thinking? What about my coffee cup? Passing the bag check, the halls widened. Shiny grey linoleum, fluorescent lights, just as promised. Just like the Hart and Dirksen buildings. 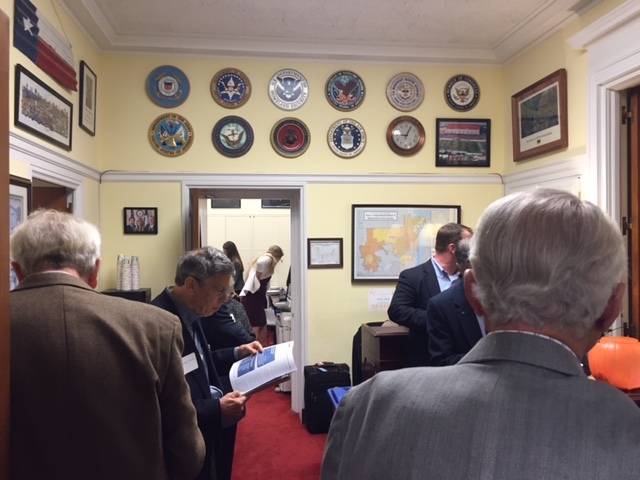 We made our way upstairs to the Judiciary Hearing Room, Room 2226. 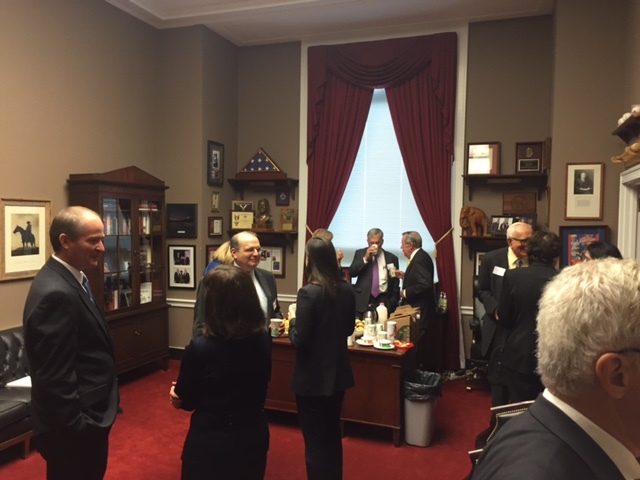 An early-morning confab of the members of the GOP Doctors Caucus was in the hearing room, discussions underway. Microphones on. All of us listening. Real issues, real bills, sausage making at its finest. An urgency to their voice. Meaningful Use Part III. Crazy. Not ready. What can we do? Can we kill it? No? Push for a delay. H.R. 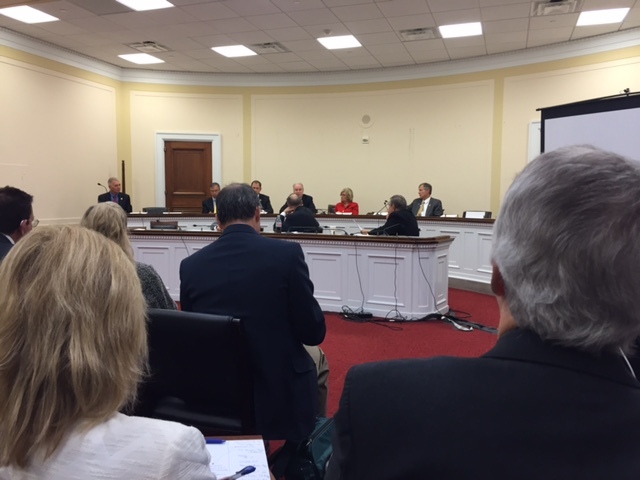 2603/S.1475: "The Saving Lives, Saving Costs Act" to permit safe harbor for physicians who follow guidelines. Add this, what do you think of that? Need to get things done by the 11th of December. A real-life physician-politician show and tell. Then when things concluded, the brief pitch: physician ranks were getting thin. You're needed. (It was not a younger crowd.) Then, off to more meetings before the debt ceiling vote. Got to go. Cynically to me it looked more like doctors were being taste-tested for the menu rather than really being at the table. It was fun. A very polite way to say "thanks for coming." Reminded me of my Navy days, just more casual. Then he was on to the next attendee. On and on, until most people that wanted to have a chance for a photo did so. We shuffled back to the Judiciary Room. Congressman Sessions made some introductory remarks. Very likable guy. Top salesman for AT&T for years, he said. He could sell anything to anyone, he boasted while smiling. Admitted the didn't know a thing about being a doctor, but seemed well-informed on many of the issues doctors face and that our patients are facing right now: high deductibles, co-pays, co-insurance, especially for those just above the poverty brackets. You could see why people like him on the Hill. He explained be was working on a bill. Obamacare is going to collapse - too expensive, he said. Maybe it was designed that way. Not touching Obamacare or Medicare, just an alternative for Medicaid. Hasn't been filed yet. Preliminary, getting ideas. He realized more work is needed. He turned things over to this his legislative aide to explain. Wanted our input, ideas. The idea seemed realistic, not far-fetched. Practical option that sounded like a way to make health care sustainable for everyone, with much less gaming of the system. But was it going to be understandable? For some, maybe. For others, it would take some education. Eleven key points, detailed, spelled out with examples. But I was interested that most doctors in attendance were independents or retired. There were few employed physicians there like me. After the seventh point in the midst of the explanation, a break. We rose and stretched, I approached the Congressman with a thought. "Are you kidding me? John, get over here." He waved to trusted orthopedic physician-colleague from his home state. "Have you heard about this?" 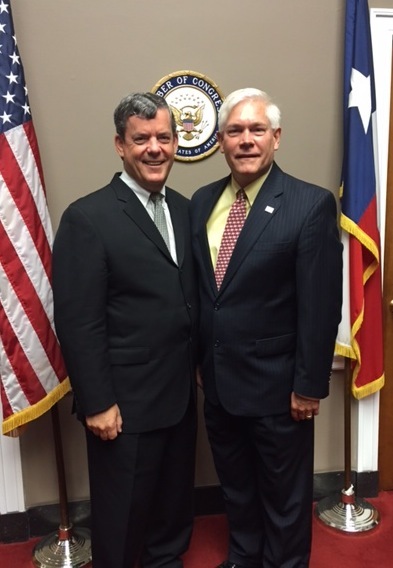 "Give me your cell phone...", Congressman Sessions said. "Give me your cell phone so I can put my contact information there. Here's mine. Enter your contact information into mine." Surprised by his response, I fumbled to enter my contact information.